Reading recommendations | Damian Trasler's Secret Blog - Do Not Read! It’s been a good week for reading. For one thing, I was lucky enough to be chosen as a Beta Reader for Brooke Johnson‘s new novel “The Wizard’s Heart”. A very different style from her steampunk “Clockwork” books, this is a gorgeous fantasy adventure, shot through with action and magic. I also took a step back in time. 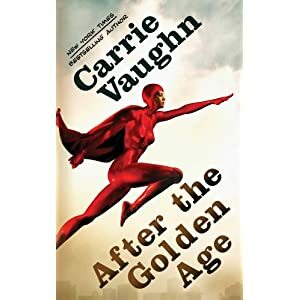 I once read Carrie Vaughn’s “After the Golden Age“. It was a time when I was reading a fair amount of superhero fiction and yearning for something new. This was it. In “After the Golden Age” we are introduced to Celia, the awkward and intransigent daughter of Mr Olympos and Spark, two members of The Olympiad that protect Commerce City. Celia has inherited NO powers, and as a result is kidnapped, repeatedly by bad guy after bad guy. Before long, her rebellious nature and familiarity with bad guy psychology leads her to actually assist the Nemesis of The Olympiad, The Destructor. The book is about power and the uses of it, but it’s also very much about family and the games they play with one another. It was a great read, with an unexpected and dramatic conclusion, and I was sad that it was over. When I saw there was a sequel in the library – “Dreams of the Golden Age“, I was tempted but also worried. What could a sequel offer? Everyone knows the problems of sequels – you want the same story over again, but new and different. You can’t have the same excitement of discovery, but having the characters do something new runs the risk of it being…wrong. 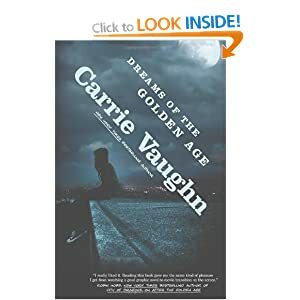 In “Dreams of the Golden Age”, Carrie Vaughn sidesteps all these problems neatly. She’s set up Celia’s character in the first book, and this one begins with Celia already the mother of two teenage girls. The eldest is seventeen, the age Celia was at her most rebellious. This book too, then is about family relationships, about trust and secrets, and how understanding your own mistakes of the past doesn’t always prevent you making new and exciting mistakes. And, of course, there are superpowers too, and crime and rescue and action. This entry was posted in Book reading, Writing and tagged Brooke Johnson, Carrie Vaughn, Golden Age, Good Books, Reading, Superheroes. Bookmark the permalink. you shouldnt keep your blog up at work in the program room!